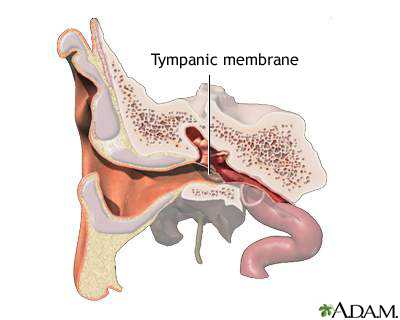 An ear exam may show a pocket or opening (perforation) in the eardrum, often with drainage. A deposit of old skin cells may be seen with a microscope or an otoscope -- a special instrument to view the ear. Sometimes a group of blood vessels may be seen in the ear. Sumana Jothi, MD, specialist in laryngology, Assistant Clinical Professor, UCSF Otolaryngology, NCHCS VA, SFVA, San Francisco, CA. Review provided by VeriMed Healthcare Network. Also reviewed by David Zieve, MD, MHA, Isla Ogilvie, PhD, and the A.D.A.M. Editorial team.